http://franksofparkville.com/wp-content/plugins/wp-mobile-detector/cache/db.php buy viagra cialis online canada Well, that took a while! Hopefully everyone’s enjoying the new site and my newly twittered self. Apart from that, really the only change I’d make is trying to rectify what is sadly a major failing in a LOT of Star Trek, where in order to make the main characters look extra heroic, the rest of Starfleet is made to look borderline incompetent. Nowhere is that more evident than in the scenes on the Enterprise-B. How do we fix this? Well, Captain Harriman could stand to be older, for a start. Maybe just a little more seasoned. When Kirk took command of the Enterprise, she was already one of Starfleet’s older vessels. What’s more, it was being sent on a long-range mission that would leave it out of the public eye for pretty much the entirety of his tenure. It was a little more conceivable that they’d give it to a younger Captain. A brand new ship being launched in a sea of press merits someone who’s already established a reputation. Seems a minor detail perhaps, but there’s a reason for it. The comes the distress call. The under-manned and under-equipped Enterprise races to help. Kirk’s companions, be they Scotty and Chekov or Spock and McCoy, both return to their old posts to help out. And Kirk, in an ego-shattering reality check, is placed on Communications. Because the fact is, with a competent Captain in the chair, they don’t need another one. Kirk has seen one of his greatest fears realized: he’s become redundant. The opening act then continues more or less unchanged, just with Harriman in command while Kirk watches from the sidelines until eventually Harriman announces he’s going to head to Deflector control and asks Kirk to take over. Kirk, recognizing that Harriman belongs on this bridge more than he does, insists that his place is on the bridge, then heads down to deflector control. He configures the deflector, sending out the beam of pure MacGuffin radiation that begins to push the Enterprise out of the Nexus. A tendril of energy lashes out at the Enterprise-B, splaying open the secondary hull, sending the entire ship catastrophically bucking. And then… cut to black. Yep. Just cut to black. This would be the last shot we’d have of the Enterprise B for quite some time. Fade back in on the Enterprise-D. The movie would again proceed more or less unaltered here. Worf’s promotion and the surrounding misunderstandings by Data on what 24th century humor is like (again, hopefully with Picard taking the swim) followed by Picard getting the news of Rene and Robert’s deaths are both good setups to the characters’ respective arcs. There’s only one major difference in my version. The scene between Data and Geordi where Data discusses using the emotion chip isn’t really bad, but the emotions stemming from a chip that can be removed or, as we later saw, turned off, leaves a bit of a plot hole in the story where it becomes necessary to claim that the chip has become “fused” to Data’s neural net and impossible to remove. In this version, Data weighs the pros and cons with Geordi and then makes a very logical decision not to risk his life using the chip. We then move forward to the distress signal for the Armagosa observatory. In the original script, the film really started to lose focus at this point. Suddenly we’ve got Romulans and Klingons all fighting over this super-weapon, stars are blowing up, and while that sounds great on paper in execution it felt kinda… small. Not only that, but as I’ve said we’ve already got a great threat in the Nexus itself. So let’s go ahead and focus on that again. First step: change the Armagosa observatory to the USS Armagosa, which is studying the Nexus and has now gotten caught in the ribbon’s outer edges. With engines failing and the ship being inexorably drawn in to the ribbon, the Enterprise is the only thing that might be able to stop them from being drawn in and destroyed. By the time the Enterprise arrives the ship is already deep in the ribbon and being torn apart – shields look to be down as well as engines, and virtually no one is left alive. Hails only raise one civilian scientist speaking over audio, a Dr. Tolian Soran, who warns the Enterprise off. Picard does his best to coordinate the rescue effort, but quickly finds he can’t concentrate and orders Riker to take over. A concerned Troi immediately follows him off the bridge. Confronting him in the ready room, she demands to know why he’s ignoring this crisis. He tells her that, right now, he’s not fit for duty. He just found out his brother and nephew are both dead. Meanwhile, Riker works with Geordi and Riker on a plan to sweep in and beam the Armagosa survivors back on board. 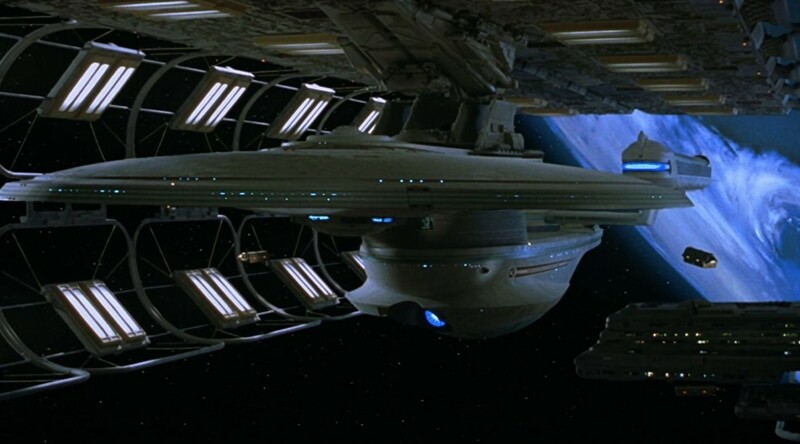 The Enterprise should only need to lower her shields for a second to perform the rescue, the hull should be strong enough to withstand anything the ribbon might do to it. Riker orders the Enterprise in. The ribbon assaults the shields to no avail as the Armagosa is ripped open. Enterprise drops her shields and begins the transport, and suddenly the entire ship is briefly bathed in light. Riker demands to know what just happened. Data, furiously working, snaps back that the sensors are down, much to the shock of everyone on the bridge. Back on the bridge, shields are restored and the Enterprise begins trying to escape. The ship is behaving strangely, with none of their maneuvers working quite like they should be. But soon the ship comes through, and the Enterprise-D is free and clear, with the Ribbon behind it. Nothing to do now but to see to the repairs and the wounded. Data, for a start, still can’t account for his momentary emotional outburst on the bridge. He and Geordi are doing their best to sort this out when Data gets his second outburst – the lovely moment where Spiner shows off his willingness to fully commit to absurdity with Guinan’s revolting drink. Yeah, I know a lot of people don’t think this scene is funny, but I start giggling every time I hear him pronounce “revolting.” So sue me! Even better though is that this gives Guinan a chance to spot Soran. The two recognize each other immediately, and begin to talk. Guinan is suspicious, realizing that him being near the Nexus is about as innocent looking as a heroin addict poking around a police evidence locker. Soran, however, is contrite and defensive, insisting that he’s changed. He’s here only to study the phenomenon so it can be stopped. The conversation leaves with Guinan torn between her loyalty to her fellow El-Aurien and her instinct that Soran hasn’t changed THAT much. This culminates in her trying to reach Picard to warn him about it, however he sends her away. 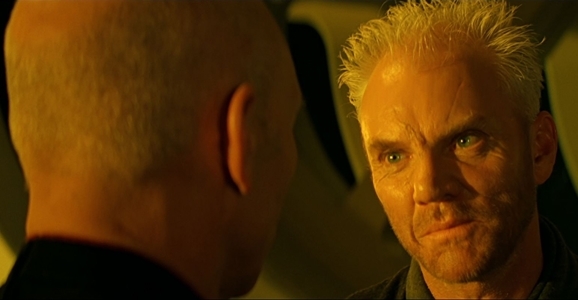 Meanwhile, Soran sees the same woman who passed by the transporter room earlier. She silently indicates he should follow her, and once they’re alone, they embrace, Soran breaking down into tears as he tells her he loves her, assuring her that this time, they won’t be separated again. Then, things get worse. By which I mean, they get better. Phenomenally. Enterprise is still largely non-functional with no explanation as to why. Everything should be working, but for whatever reason much of it doesn’t. But apart from that, all over the ship things seem to be going great. Little things at first, like people suddenly getting a straight flush during a poker game or messages from home relaying good news. But over time it seems to get more and more promising. Despite the ship’s damage people are all fantastically happy, and the mood just seems to keep getting better. Even Picard gets a small ray of hope in a message suggesting that investigators are no longer certain both Robert and Rene were present during the fire, and he returns to duty. Unfortunately, the survivors of the Armagosa are another story. They seem to be borderline catatonic at this point, though there still are all the signs of heavy brain activity. The only thing scans reveal their systems are flooded with endorphins. Beverly and her staff do their best to get to the bottom of it, but every one of their instruments insist that the crew is in perfect health. The only one who seems to be unaffected is Soran, who is at a loss as well. I mean COME ON, how can you not trust this face? Meanwhile, on the bridge, Worf is enjoying the view from the Captain’s chair afforded to him by his new rank, yet another little accomplishment that’s got him in a good mood (or at least as close as Worf ever gets to a good mood.) It’s all fairly uneventful until sensors detect a starship on approach without any kind of identity transponder. Even stranger, it appears to have come out of nowhere, with no warp trail indicating its entry to the area or possible hiding places it could have emerged from. Curious, Worf informs the Captain and hails the ship, identifying themselves as the USS Enterprise. The response comes in the form of phaser fire. The D is still heavily damaged, but not so much that they can’t fire back. The two ships begin to exchange fire as a battle begins. Meanwhile, civilians are rushing to emergency shelters. Guinan and Soran find each other in this mad scramble, with Soran near panic at the attack. They pass by a window in time to see the attackers swoop past, phasers firing, and are both visibly stunned. Guinan tells Soran to follow the rest to the shelters as she runs to an officer, telling them that she needs to get to the bridge immediately. They do. Through the dome at the top of the bridge, space seems to be ripping apart to reveal the twisting orange energy of the Nexus beyond. The camera pans back down over a very different bridge – alarms are flashing on every console, coolant is venting, and the computer warns against imminent hull breaches. Reality has re-asserted itself. The Enterprise is trapped in the Nexus, and has been ever since they dropped shields to beam the survivors of the Armagosa on board. The ship has been drifting in the ribbon, unshielded, for days. With the illusion broken, the crew moves quickly. Worf, upon reviewing sensors, discovers that the new starship has been attacking them with her phasers set on minimal power. The “damage” they inflicted was in fact just the damage already done by the ribbon. Picard orders Worf to put the attacker on screen. Their attacker is real, it seems. A badly battered, but still sturdy Excelsior class vessel with the registration number NCC-1701-B just barely visible through the many repairs to her saucer. Picard orders them to hail the other Enterprise, and James T. Kirk, flanked by whatever other original cast members were with him at the start of the film, appears on the screen. And while I’d planned for this to be the last entry on Generations, I hate to say that this more exhaustive synopsis has already gotten much larger than I expected it would. Given that this would seem to be a perfect spot for a commercial break were it a TV show, I’m going to stop here for now. Come back on Sunday for the (hopefully) thrilling conclusion and the probably much less thrilling wrap up!